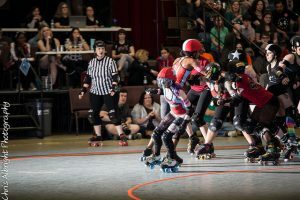 I got suckered into this derby business in 2011 after what felt like a lifetime of no skating and wham! I’m hooked. Next thing you know, I am fresh meat, practicing 5 days a week, and have three derby sites bookmarked on the home-screen of my phone. Hubs comes home two years ago and finds me passed out in bed with the laptop on the side table playing live regional derby coverage. Yes, it was immediately that bad. Normal? Probably not, but who’s to say what normal really is? 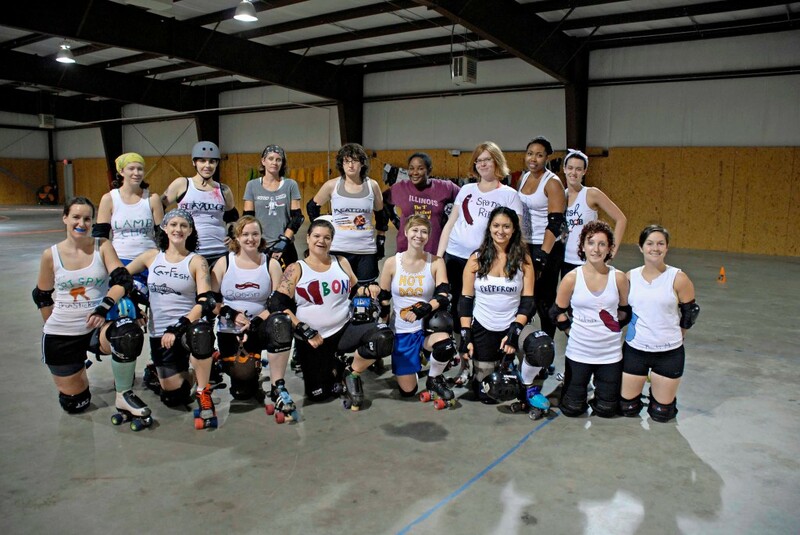 I would also venture to say that my immediate lust for derby fed what was not a “normal” tryout journey. I didn’t have one of those tryout processes where hard work was rewarded with instant gratification. Rather, I managed to encounter what could have been perceived as set-back after set-back. Instead I found challenge after challenge. I share this now because recruitment season is upon us and for the first time I am on the other side. I am Feral Brady, an Apocalypstix rookie. That doesn’t mean I don’t feel the fear and excitement starting to build for the girls considering trying out. Rather, I feel it more intimately. I know. I know it isn’t normal and I want them to know (YOU to know) that being dedicated, hardworking, and in a long-term relationship with the sport of your dreams is perfectly okay. I had a past on skates. 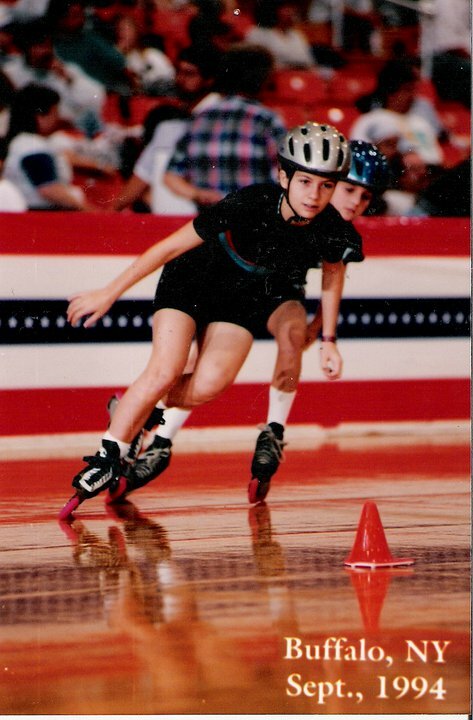 I had grown up competing in speed skating. I spent my teens practicing four to five days per week on skates and traveling frequently for regional and national competitions. However, I hadn’t been on skates in over 10 years. I actually didn’t even own skates anymore. On borrowed skates and without a clue what I was getting myself into, I went to the first assessment of the fresh meat cycle. I managed to pass and spent the next two days crying because I don’t think I had ever been that sore. Seriously. Despite the pain…after just a few practices I was hooked. Totally hooked. I threw myself into training and learning and spent more than my fair share of time in a bathtub full of Epsom salt. Things were moving along fairly well until I broke my wrist. When it happened I stayed for the rest of scrimmage and then drove myself to the hospital only because people made me promise to. When that ER doctor told me it was broken I ugly cried. Not because it hurt, but because I was finished with the tryout process. While I was ordered to be off skates I schemed up a way to keep my status as meat active and stuck to it. I skated three weeks with that cast as much as possible (you have no clue how bad that thing smelled after all that sweat!). 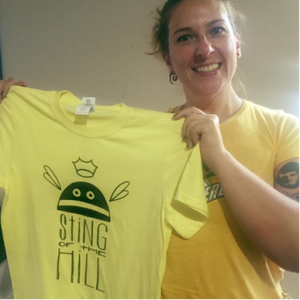 I skated endurance practices with a local speed team and watched a lot of derby. Before I knew it I was scrimmaging again. I was elated. Two weeks later I broke my shoulder. Yes, two broken bones in 8 weeks. That was the nail in tryout #1’s coffin. I came back with a desire so strong I could taste it. The first go round just showed me that skating wasn’t in my past…it was in my blood. I couldn’t have walked away from this process if I had tried. Yes, I came back. Yes, I realize some would call that crazy. Why? Because I didn’t do all that for nothing. I had learned that the limits I thought I had were really only fear. I had learned that I am capable of more than I ever imagined. I know that I am better for my family when I have this fire burning in my chest and the smile plastered on my face. I felt better when I reeked of sweat and people walked to the other side of the grocery store aisle to avoid me. Nothing to show? I had everything to show. I had a new-found confidence that not only my husband, but also my children, saw. I had new friends who shared this disease; this thing that gets in your blood and the only way to treat it is to feed it. I was not starting from the beginning. If I were starting from the beginning I would have been unsure and indifferent. Instead, I knew. I wanted it. I needed it. I would work as hard as I had to in order to achieve it. I think the beginning of this post leads you clearly to the end. Three was my lucky number. I finished that recruitment season by being drafted to the Apocalypstix. I have a new favorite color, pink, and a new family of women who understand my love for this amazing sport. As I look back and share this (abbreviated) epic journey with you all, I get excited for the people who may be on this same path. Women who have a dream to skate and train and sweat and be fierce. I personally cannot wait to meet the new recruits! I can’t wait to see the same fire in their eyes that I distinctly remember. I am nervous because it isn’t easy. Derby is not something that comes easy. It is not for everyone. But it is something worth working for. It is worth the commitment. It is worth the blood, sweat, and tears. It isn’t the norm, but who’s to say what normal really is.